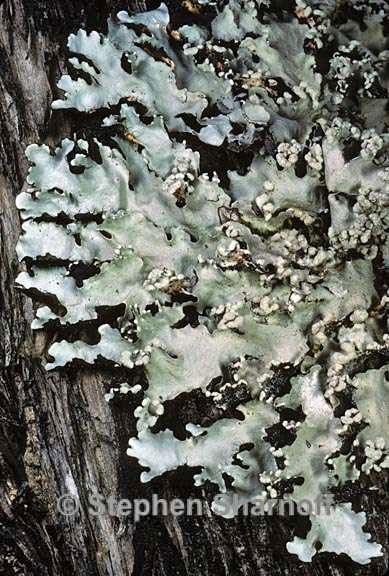 Thallus: foliose, loosely adnate, 4-20 cm in diam., lobate lobes: subirregular, elongate, slightly imbricate, plane, separate, 5-15 mm wide; margin: deeply crenate; apices: rotund, sometimes subascending, ciliate; cilia: simple, up to 3.0 mm long upper surface: pale gray to gray-green, smooth, dull, strongly reticulately maculate soredia: common, powdery to subpustular, laminal or marginal, in linear to orbicular soralia that are often subcapitate, or spreading and becoming somewhat diffuse; isidia, pustulae and dactyls absent medulla: white with continuous algal layer lower surface: black with narrow brown to rarely white, papillate zone peripherally, centrally rhizinate; rhizines: scattered to dense, mostly simple (to squarrose), black Apothecia: rare, submarginal, substipitate, up to 8 mm in diam. ; margin: thick, thalline, entire to crenulate, sorediate; disc: perforate, brown to dark brown, concave ascospores: simple, hyaline, ellipsoid, 12-18 x 8-11 µm Pycnidia: rare, punctiform conidia: filiform, 12-16 x 1-1.5 µm Spot tests: upper cortex K+ yellow, C-, KC-, P+ yellow; medulla K+ yellow turning deep red, C-, KC-, P+ orange Secondary metabolites: upper cortex with atranorin and chloroatranorin; medulla with salazinic acid (major) and consalazinic acids (minor). Substrate and ecology: commonly on rocks, also on trees in open habitats World distribution: pansubtropical and pantemperate; North and South America, Africa, southern Asia, Australasia, Oceania Sonoran distribution: common in SE Arizona and southwards in the Sierra Madre Occidental region of Chihuahua, Sonora and Sinaloa and southern mountains of Baja California Sur.